Last week, a presentation was arranged by BMW in Miramas (France) where the automaker exhibited their upcoming technology for vehicles. The main focus of this presentation was the i8 technology adopting hydrogen fuel cell. 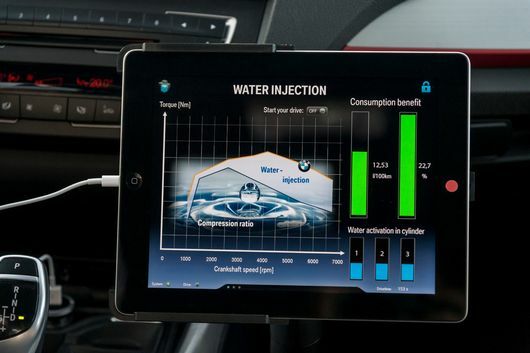 The 5-Series Gran Turismo and a 2-Series Active Tourer plug-in hybrid were also in the stream but the prototype equipped with power-boosting water injection technology was of keen interest. This technology is not a new one as we have seen such systems in other vehicles as well. However, this latest technology has typically been customized for turbo engines. The technology works in the manner whereby a mist is sprayed both in the intake manifold and then into the cylinder chambers where it cools down the pressurized air mixture before combustion. This cooling down is critical in order to make up the efficiency that ultimately enhances the power. BMW claims that this system gives an impressive 10% increase in power and 8% increase in the efficiency. The best thing about this system is the maximized efficiency which makes this technology quite attractive for the sports drivers. Underlying mechanism shows a drop in temperature of the fuel before it enters the combustion chamber thus no more fuel is required in the chamber. All the water drains into a tank whenever the engine is switched off. This system also guards the engine during freezing temperatures because the water sink tank is itself positioned in the frost-protected place. Water injection system has already been introduced by BMW in its M4 safety car for MotoGP. However in the previous edition,water had to be refilled every time the car set on a journey. In the 1-Series prototype, the water in the tank is always topped-up due to continuous water recovery through the condensation process. BMW hasn’t confirmed when this prototype will be released officially but it is expected to appear in track-focused M4 GTS set to debut this year.